This colourful salad has a festive feel with the addition of pomegranates & sweet potatoes. 1. In a small saucepan, boil the sweet potato for 5-8 minutes or just until tender. Drain well and set aside for about 10 minutes, until cool. 2. Make the dressing: In a small bowl, whisk together the pomegranate juice, oil, vinegar and honey. Set aside. 3. Arrange the kale in a large bowl. Add the dressing and massage the leaves with your fingers for about 2-3 minutes. 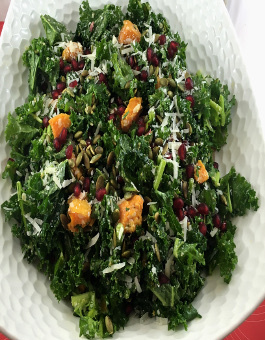 Sprinkle with the pomegranate seeds, pumpkin seeds, grated parmesan and cooled cooked sweet potato. Toss and serve.